84 Lumber appears to be laying the foundation for significant expansion efforts. In recent weeks, the company announced that it is realigning operations into four divisions – Central, Mid-Atlantic, Southeast and Southwest. The Central division becomes home to 84 Lumber’s geographic base and includes Pennsylvania, Ohio, Virginia, West Virginia and New York. Recent store openings in Massachusetts, Florida and Texas, all relatively new markets for the company, provide additional insight on things to come. CSG projects 10-15 new store openings in the next 12-18 months. 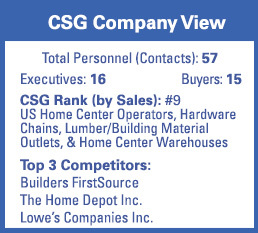 Source: Chain Store Guide, Home Center Operators & Hardware Chains Database.